A very attractive an unusual c. 1920 jigsaw puzzle atlas published by G. Pauly. 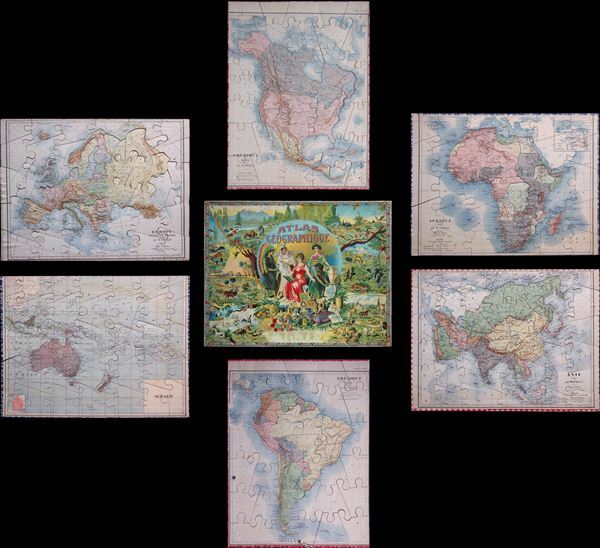 Mounted on balsa wood, it consists of a custom box of six interesting jigsaw puzzle maps: North America, South America, Europe, Asia, Africa and Oceania. The set, originally with seven maps, is missing the World map. Each map is mounted on a board and dissected as a jigsaw puzzle. Countries and regions are individually dissected along their boundaries while oceans are dissected into more traditional jigsaw puzzle patterns. The North America map is divided into United States, Mexico, Central America and Canada. Alaska, which was bought from Russia in 1867, is shown as an incorporated territory of the United States. South America map extends from Honduras to Cape Horn. The Asia map extends from the Arctic Circle to the Indian Ocean. The sea between Japan and Korea, whose name, either the 'Sea of Korea' or the 'Sea of Japan,' is currently a matter of historical and political dispute between the two countries, is here identified in favor of Japan (Mer Du Japon). Africa is well mapped and includes an inset of the Suez Canal and the Nile Delta (Delta du Nile et Canal de Suez). The physical and political map of Europe extends from the Arctic Ocean to the Mediterranean Sea and includes Iceland. It features 'Tcheco-Slovaquie' (Czechoslovakia), and 'Etat des Serbes, Croates, Slovenes' (Yugoslavia), created after World War I. Various rivers, cities, towns, mountain ranges, railroad lines, sea routes, and other topographical details are features on each of the maps. The box features a beautiful image with women from different parts of the world, surrounded by flora and fauna from across the world. Generally very good condition. Wear and damage to box, especially at edges. Maps are in very good condition and complete. Small pin holes near corners of maps. See photos. Missing world map.